The Lhasa Apso was only bred in Tibet, by the holy men and the nobles, for at least two thousand years. They were used as watchdogs in the temples and monasteries. The people of Tibet greatly respected these little dogs as they believed they were the reincarnations of the holy lamas. It was great honour to receive this breed as a gift. It was never sold, only gifted. 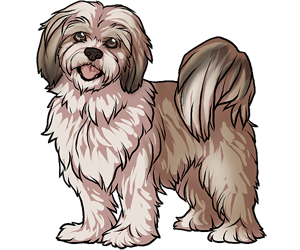 The Lhasa was first seen in Britain in the 1920’s and introduced to America in the 1930’s. Many people consider that a Lhasa Apso born with a kink in it's tail brings good luck. The name Lhasa Apso comes from Lhasa, the capital city of Tibet, and apso, a corruption of the Tibetan word rapso, which means shaggy and goatlike.